Adolphe Sax’s adopted country has been kind to his invention, as this NAXOS recording containing some of the best saxophone chamber music ever composed amply demonstrates. The saxophone has always held a tenuous position in the symphony orchestra. Perhaps because of its relatively late invention (around 1845), it’s never really become a full-fledged part of the wind section. Undoubtedly too, some composers have found the saxophone’s sonorities to be better suited for wind ensembles and pop bands than for classical music. But if there’s one place where the saxophone has been integrated into the orchestral fabric better than anywhere else, it’s in France. That may be because the saxophone’s inventor, Adolphe Sax, was a Parisian resident (though born in Belgium). And the instrument became popular with musicians at the Paris Conservatoire, the most important music school in France. The composer Hector Berlioz was an early advocate of the saxophone, and yet we don’t find the instrument cropping up in many of his scores (except for the concert band masterpiece Grande Symphonie Funèbre et Triomphale). By the 1870s, we can hear the saxophone playing beautiful (and important) solo passages in Leo Délibes’ musical score to the grand ballet Sylvia, as well as in Georges Bizet’s L’Arlésienne incidental music. And over the years, many other French composers would create concertante pieces featuring the saxophone with orchestra. Among them are works by Vincent d’Indy, Claude Debussy, André Caplet, Jacques Ibert, Darius Milhaud, Henri Tomasi … and Florent Schmitt. A vintage copy of the score to Florent Schmitt’s Légende, composed in 1918. 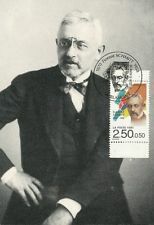 The Schmitt piece is the Légende, Opus 66, which was composed in 1918. 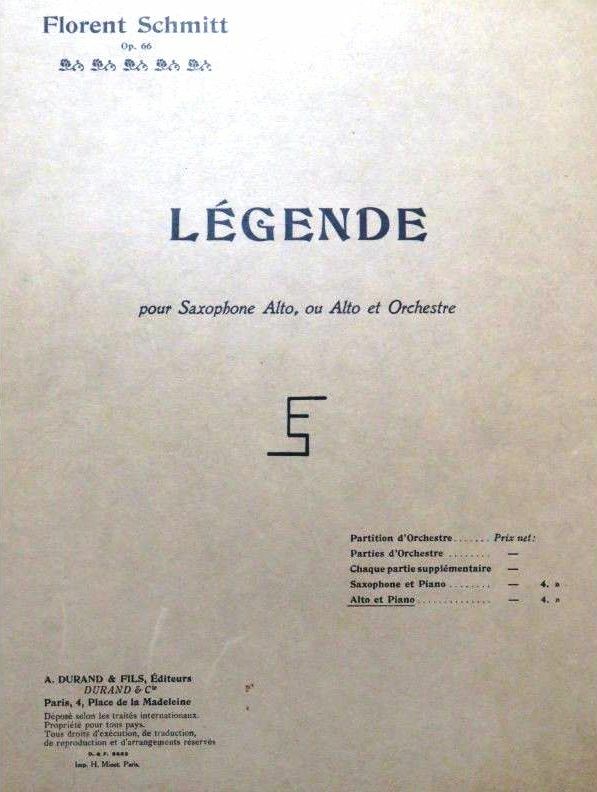 The Légende exists in composer-sanctioned versions for saxophone, for violin and for viola, accompanied by orchestra or piano — although it is the saxophone versions that are the most popular and oft-performed. It’s a pretty incredible piece of music. Within the span of just ten minutes or so, Schmitt offers us a rhapsodic ballad that is amazing in its breadth and depth of atmosphere, with a masterfully colorful orchestration coexisting with the solo saxophone. To me, it seems like an unsettled, fitful dream sequence … and I also hear more than a hint of the orientalisms that were so common in Schmitt’s scores of the period. This is a piece of music I’ve known for decades – one that that never grows old. 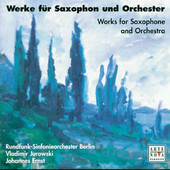 One of my favorite commercially recorded performances features saxophonist Johannes Ernst with the Berlin Radio Symphony Orchestra conducted by Vladimir Jurowski, recorded in 1998 and released on the Arte Nova label. 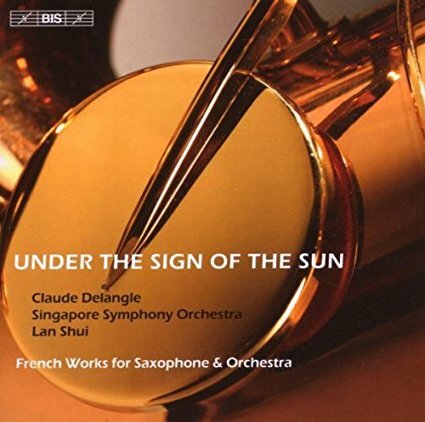 A later recording (2007) from BIS is equally fine, featuring saxophone player Claude Delangle with the Singapore Symphony Orchestra conducted by Lan Shui. YouTube has numerous live performances documented of the saxophone and piano version, as the Légende continues to grow in popularity around the world. One of the best of these was recorded in Italy in 2010 and features Stefano Papa on the saxophone along with pianist Daniele Albericci. 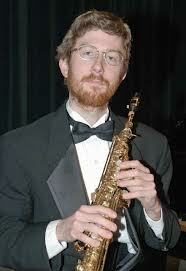 Saxophonist Christopher Bartz: His fine performance of Florent Schmitt’s “Legende” is uploaded on YouTube. And just recently, a fine orchestral performance of the Légende was uploaded on YouTube featuring saxophonist Christopher Bartz and the University of Southern California Orchestra (Thornton). Even more famous than the Légende is Schmitt’s Saxophone Quartet, Opus 102, written in 1941 when the composer was 71 years old. While the very idea of a piece featuring four saxophones may seem unusual, there are actually quite a few works of this kind in existence, thanks in part to the Paris Conservatoire’s need for recital and contest pieces. The legendary French classical saxophone player Marcel Mule (1901-2001) was also instrumental in encouraging composers to write for his saxophone quartet — for which they were happy to oblige during the period from about 1930 up to the early 1960s. 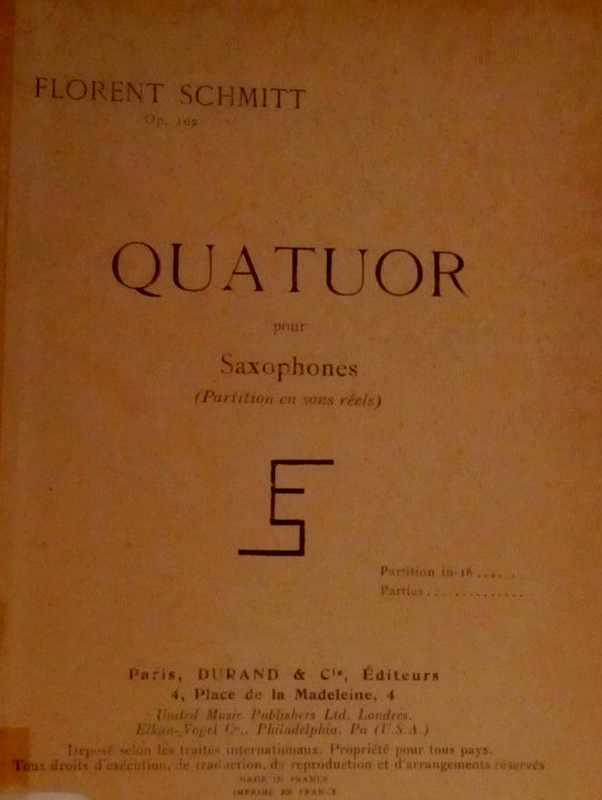 So we see that Florent Schmitt’s piece stands alongside other notable French works for saxophone quartet like Gabriel Pierné’s Introduction & Variations on a Popular Rondo (1930), Jean Françaix’s Petit Quatuor (1936), Jean Absil’s Saxophone Quartet (1937), Jean Rivier’s Grave et Presto (1939), Eugène Bozza’s Andante et Scherzo (1938) and Nuages (1946), and Alfred Désenclos’ Saxophone Quartet (1962). A photo portrait of Florent Schmitt, taken about the time he composed the Saxophone Quartet. The Quartet has been well-served in recordings, with particularly effective performances done by the Deffayet Saxophone Quartet on EMI and the Diastema Saxophone Quartet on NAXOS, along with recordings by the Syrinx Quartet, the Aurelia Quartet, the Linos Quartet and others. The first U.S. recording was made in the early 1970s by the American Saxophone Quartet (comprised of saxophonists George Wolfe, James Kaiser, Dean Kluesner and Dennis Bamber), which appeared on the Coronet label. While that performance sounds a bit rough-hewn to my ears, there’s no doubt that the recording helped bring this music to the attention of American musicians and audiences. As in the Légende, the music in Schmitt’s Quartet is highly inventive, easily holding the listener’s interest from first note to last. Master orchestral colorist that he was, Schmitt manages to coax a surprisingly wide variety of sounds and sonorities from the four saxophones. It would seem that the highly interesting saxophone compositions of Florent Schmitt – and several of his fellow French compatriots – have helped that process along greatly. This entry was posted in Chamber Music, Classical Music, Composers, French Composers, Uncategorized and tagged Christopher Bartz, Classical Music, Claude Delangle, Florent Schmitt, French Composers, Johannes Ernst, Music, Nones, Phillip Nones, Saxophone, Saxophone Quartet, Zzyzx Quartet. Bookmark the permalink. 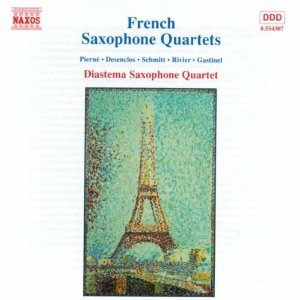 The first recording that I bought of Schmitt’s Saxophone quartet was on a cassette entitled “Musique Française pour Saxophones” performed by Quatuor Adolphe Sax. The recording also included the Légende, and I still have it to this day. Also, I once wrote a 20-page piece on Florent Schmitt which was published in “Frederick Delius: Music, Art and Literature”. (Ashgate. 1997). I also have a photograph of Florent Schmitt together with the English composer Ralph Vaughan Williams which was taken in 1956, and another of Florent Schmitt with the music critic Felix Aprahamian which was taken at the premier of Schmitt’s 2nd Symphony in Strasbourg in 1958. Thank you for your comments, Mr. Eccott. They are very interesting. I have seen the photo of Schmitt with Vaughan-Williams. There is another interesting photo of Schmitt and Stravinsky (along with Stravinsky’s wife, Vera) that was taken at a U.S. embassy reception in Paris in 1957. As for your comment about Schmitt’s orchestral rarities, there may be several other compositions that haven’t yet been recorded besides the “Plein Air” music. One I’m hoping will be recorded someday is the ballet music for “Le Petit elfe Ferme l’oeil” (Op. 73) which was an expansion of a work (Op. 58) first written for two pianists (similar to Ravel’s expansion of his “Mother Goose” two-pianist suite into a full-length ballet). I’ve been trying to get several conductors interested in this score, but so far, unfortunately no takers! About the Saxophone Quartet, I believe the first recording of that work was on a London/Decca 10″ LP (LS 1076), featuring the Marcel Mule Quartet. It was released in the mid-1950s. If anyone knows of an earlier commercial recording, please let me know. Thank you for your reply to my recent post. Although I couldn’t say for certain, I would think that you’re correct in stating that the first recording of Schmitt’s Saxophone Quartet was on a London/Decca LP (LS 1076), featuring the Marcel Mule Quartet. Yes, the ballet music for “Le Petit elfe ferme l’oeil” is something that I, for some time now, have also been hoping would appear. At least with the recent Dutton release we have Leslie de’Ath and Anya Alexeyev playing the version expanded by Schmitt for the ballet music. Even so, it would still be marvellous to hear the work in its orchestral dressing. “Le Petit elfe ferme l’oeil” and “Musique de Plein Air” would make an ideal coupling. Perhaps Jacques Mercier and Orchestre National de Lorraine could be persuaded, as they did such a wonderful job with their 2006 recording of “Antoine et Cleopatre” and “Mirages”. Returning to the quartets, I am presently transcribing the Quartet for Three Trombones & Tuba onto Sibelius score writer, mainly to gain an idea of how it sounds. So far it’s progressing well and the virtual instrument playback is reasonably good. I’ll see how it shapes up before deciding what to do with it. Please let me know if/when you complete the Trombone/Tuba Quartet score. I know several professional trombonists who I think would be very interested in learning more about this piece, and possibly performing it. I am unaware of any performance of this music (either commercially or recorded in concert) that’s ever been made available. Oh yes, I shall certainly complete my work on Florent Schmitt’s Quartet for three trombones and tuba. I believe in finishing what I start, and I hope to have it ready early in 2013. I am, in fact, a professional trombonist, so it’s quite an interesting project for me. As I’m working my way through, I’m finding some wrong notes in the parts, most of which are obvious, but there are others which are a little ambiguous, but I’m taking notes of any corrections that I make. The first trombone part poses a bit of a problem on account of it being rather high, which is typical of French trombone writing of the period. French trombonists tended to use small-bore instruments which facilitated upper register playing to quite a degree, and that’s why high trombone solos appear in, for instance, Ravel’s “Bolero” and “L’enfant et les sortileges”. However, it shouldn’t be a problem for a professional who would use an appropriate instrument, or even an alto trombone. The piece also follows the French tradition of using three tenors, as opposed to two tenors and a bass, but the third part is well within the range of a bass trombone. I’m certain that there has never been a commercial recording of the work. In his “L’oeuvre de Florent Schmitt”, Yves Hucher gives a first performance date of 11th March 1949 by the Quatuor Tulout. Although I can’t say for certain, this may well have been the one and only performance of the piece. Interestingly, Hucher also says that the work ‘ought to be heard under the fingers of Marcelle de Lacour, to whom it is dedicated’ (‘Qu’il faut entendre sous les doigts de sa dédicataire, Marcelle de Lacour’). The fact that he explicitly states ‘under the fingers’ (‘sous les doigts’) suggests that it was performed on valve trombones. If so, that would have been extremely unusual for trombonists in France who, like the English and the Germans, etc., used slide trombones. It was really only in Italy that valve trombones were used in the orchestra. For instance, the trombone parts in the operas of Verdi are written specifically for valve trombones. The only reason I can see for valve trombones being used is that the fast 2nd movement of the work has some very rapid scale passages which might (although not necessarily) be difficult for a slide trombone. Today, valve trombones are only really encountered in marching bands, mostly in America. But, these days, trombonists are asked to perform all manner of things, so such matters shouldn’t really deter a good professional. If you know of professional trombonists who might be interested, then perhaps an eventual performance is a possibility. I’m very interested in seeing/hearing this ‘new’ Schmitt work for trombones/tuba. As you know, we trombonists are always looking for more material, and having an original piece brought back to life would be fantastic. Please keep us posted! Will do, Tim. Thanks for your interest! David: Tim Smith is a fantastic trombonist with the Buffalo Philharmonic Orchestra here in the USA. Just last week, he and the other members of the BPO’s trombone section played the world premiere performances of the Triple Trombone Concerto by Eric Ewazen, along with the BPO under the direction of conductor JoAnn Falletta. Greetings from the UK. Thanks for your reply. Nice to make your acquaintance. Your interest in this gives me added motivation to complete the transcription. Once it’s all done we’ll work out a way of getting my transcribed score and the parts to you, along with a WAV or an mp3 file of the virtual instrument rendition. Dave/Tim: I will be happy to be the “conduit” by which you can send and receive the score and parts when the time is right. Thanks to all. In a recent contribution to this thread I mentioned that Florent Schmitt’s Quartet for Three Trombones & Tuba might have first be performed on valve trombones rather than slide trombones. My reason for suggesting this was the fact that Yves Hucher, in his “L’oeuvre de Florent Schmitt”, stated that the work ‘ought to be heard under the fingers of Marcelle de Lacour, to whom it is dedicated’. Bearing Hucher‘s words in mind, a performance on valve trombones seemed a reasonable assumption to make. However, after undertaking a little research, it seems that my supposition was, almost certainly, incorrect. I think I have now solved the mystery of what Hucher actually meant by ‘under the fingers’, but it only opens up another mystery. As it turns out, Marcelle de Lacour (1896 – 1997) who, coincidentally, was born in Alsace-Lorraine like Florent Schmitt, was a harpsichord player. She studied in Paris with Wanda Landowska and performed as a harpsichord soloist throughout Europe, often playing works by contemporary composers, which apparently included Florent Schmitt. Now, whilst Hucher’s words ‘under the fingers’ makes more sense if we assume that he meant “under the fingers of Marcelle de Lacour the harpsichord player”, it not only begs the question as to why Florent Schmitt dedicated a work for three trombones and tuba to a harpsichord player … but also why and how the work apparently came to be performed on the harpsichord. We might assume that the work was originally written for harpsichord and later adapted by Schmitt for trombones and tuba, but having studied the work I can find no evidence in the style of the writing that it was ever a piece for harpsichord. The work is so characteristic of the instruments for which it is written, and seems to have been conceived exclusively for those instruments. Moreover, Hucher does not list the work as originally having been a harpsichord piece — nor indeed does he mention Schmitt as ever having written anything for harpsichord either as a solo instrument or as part of an ensemble. There is no evidence of it having been later adapted for harpsichord either, unless Marcelle de Lacour herself made an arrangement of it for harpsichord. But, if this were the case, why choose a piece for trombones and tuba? One of Schmitt’s piano pieces would have surely been a more appropriate choice. So, being a trombonist myself, and having become extremely familiar with the piece, I am now convinced that the work is an original piece for trombones and tuba, and that it was performed on slide trombones at its premiere in 1946 by the Quatuor Tuluot. I am also convinced that Schmitt intended the fast scale-like passages in the second movement to be executed as glissandi. But, the work’s apparent relationship with the harpsichord remains a mystery. Perhaps some further information regarding this peculiar mystery will eventually come to light. Thank you for the very interesting follow-up post, David. While I have no knowledge at all about the intended scoring of this work, I do know that at least one other composition of Schmitt’s was scored to include a harpsichord: the Sonatine en Trio, Op. 85 (for flute, clarinet and harpsichord). Thank you, Phillip, for your reply. Yes, you’re absolutely right. I had overlooked this, but the “Sonatine en Trio” for “piano ou clavecin, flûte et clarinette” (piano or harpsichord, flute and clarinete) is listed by Hucher as opus 85. He also lists the same work as 85bis scored for piano, violin and ‘cello. There is also the “Clavecin Obtempérant, suite en quatre parties” listed as Op. 107, which Hucher says was first performed by Marcelle De Lacour on 26 février 1946. This work seems particularly interesting with regard to this discussion, as it appears, contrary to my earlier remark, to be a work for solo harpsichord, – performed by the dedicatee of the Quartet for Three Trombones and Tuba. There are some further references to the “Clavecin Obtempérant” in Hucher’s catalogue, which I shall look up in due course. I think I can finally see what is going on concerning the “mysteries” relating to Florent Schmitt’s Quartet for Trombones & Tuba that have been outlined above. Let me expand a little and finally put this matter to bed. So, to finally put the matter right, it was not the “Quartet for Three Trombones & Tuba” that was dedicated to Marcelle de Lacour (as Hucher erroneously implies), but the “Clavecin obtempérant”. Considering that Marcelle was a harpsichord player, having a work for harpsichord dedicated to her makes much more sense than having a piece for trombones and tuba dedicated to her! We can also rest assured that the Quartet for Three trombones & Tuba was, in fact, originally conceived for three trombones and tuba, and wasn’t an arrangement of a piece for harpsichord, nor was it subsequently arranged for harpsichord, and that it was played on slide trombones at its first performance and not ‘under the fingers’ of valve trombonists, as Hucher‘s statement, understandable I think, led me to believe! Well, at least I got there in the end, but I would like to extend apologies to any readers of this blog who have become bored with this little side excursion into the strange world of trombones, tubas … and harpsichords.